Students will travel across Spain and Portugal accompanied by their professors, gaining hands-on insight and understanding into the European Union. Students will take one or two, three credit courses sponsored by the prestigious and AACSB accredited IQS School of Management in Barcelona. For two weeks students will take classes at IQS. The in-class instruction will be enhanced by professional visits to leading international companies and organizations. Students will be immersed in the different languages and the distinctive cultures of the countries visited. Students will be expected to interact with locals and to explore the perspectives of the native population on art, history, food, entertainment and politics. During our "Introduction to the EU" daily debrief sessions, students will be required to share their experiences outside of the classroom with the other students and the professors. All majors welcome! This program is relevant for any university student interested in exploring the art, history, politics, business or economics of the European Union. EARN ACADEMIC CREDIT -- This program is academically sponsored by the IQS School of Management in Barcelona, a very prestigious and AACSB-accredited university. Students accepted to Explore Europe will be formally accepted at IQS and will receive official transcripts from the university to facilitate credit transfer. PRICES INCLUDE -- Accommodations in apartments and highly rated, city center hotels with private bath, excellent access to public transportation, breakfast and internet (all but Paris have free WiFi). All transportation between the cities will be by train. Each student will receive a length of stay transportation card for all cities visited. All participants are covered by health insurance while in Europe. The aforementioned plus much more is included. See details about more of what is included in the program cost. June 16th - 30th: Barcelona, the Capital of Catalonia, is filled with fashionable boutiques, high street stores and historical architecture. Barcelona is located directly on the northeastern Mediterranean coast of Spain. It has a rich history dating back at least 2,000 years when it gained prominence as a Roman town under its old name, Barcino. This beautiful city is full of what European cities are known for (outdoor markets, restaurants, shops, museums and churches). Walk through the center of the city and visit the many museums, art galleries and monuments, and enjoy the never-ending selection of fine restaurants, bars and activities. The beaches, the city was built upon, provide sun and relaxation during the long periods of agreeably warm weather. Barcelona is home to one of Europe’s best football clubs, FC Barcelona. July 1st - 4th: Madrid, the Capital and largest city of Spain, is located on the Manzanares River in the center of the country. Madrid is the seat of government and the residence of the Spanish monarch. Madrid’s influences in politics, economics, education, entertainment, environment, media, fashion, science, culture, and the arts contribute to its status as one of the world's major global cities. While Madrid possesses a modern infrastructure, it has preserved the look and feel of many of its historic neighborhoods and streets. Its landmarks include the Royal Palace of Madrid; the Royal Theatre and Opera House and the National Library building. Madrid also has a large number of world-class museums including the Prado Museum, the Museo Nacional Centro de Arte Reina Sofía and the Thyssen-Bornemisza Museum. The Cibeles Palace and Fountain have become the monument symbol of the city. Madrid boasts some of the liveliest nightlife in the world. July 5th - 9th: Lisbon, the Capital city and largest city of Portugal, is one of the oldest cities in the world, and the oldest city in Western Europe. In 1147, the Crusaders re-conquered the city and ever since has been a major political, economic, and cultural center of Portugal and a recognized global city. Perched on the edge of the Atlantic Ocean, Lisbon is one of the rare Western European cities that face the ocean and uses water as an element that defines the city. Lisbon is one of the major economic centers on the continent, with a growing financial sector and the largest container port on Europe's Atlantic coast. It is also the political center of the country, as seat of Government and residence of the Head of State. Lisbon enchants visitors with its white bleached limestone buildings, intimate alleyways and an easy going charm. Beaches, historic monuments, gastronomy, art and design are among the experiences Lisbon has to offer. Small group size: 20 students max. 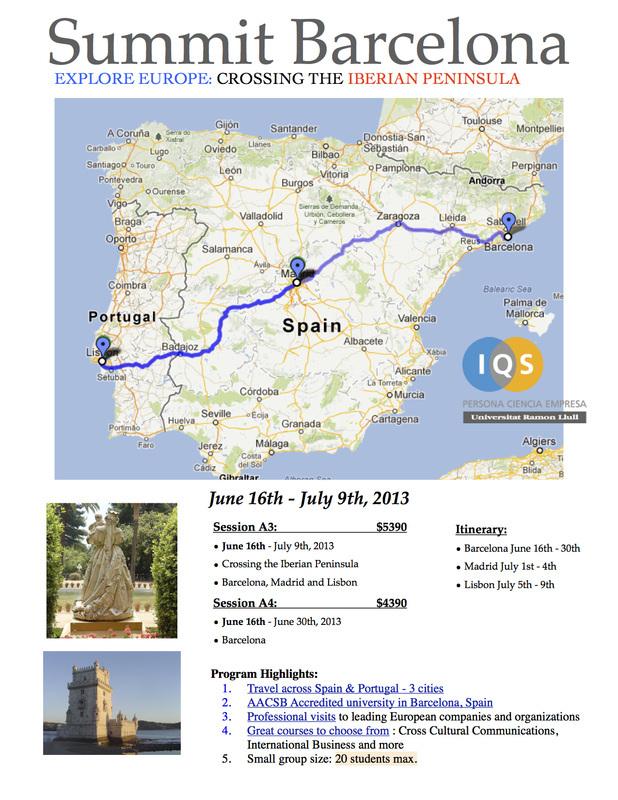 The Summit program in Europe is hosted and organized by the IQS School of Management. Participating students will be officially enrolled in IQS. Upon completion of the program, students will receive their grades, and official transcripts issued through the registrars office. IQS School of Management is a century-old university center, founded by the Jesuits, with great tradition and prestige in the industrial and business world. 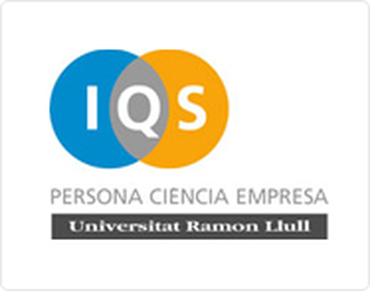 IQS is a founding member of the Ramon Llull University. The IQS School of Management is recognized as one of the best undergraduate schools for Business Administration in Spain, and stands out for its specific Masters' programs, and for the integral education of its graduates and their capacity to manage industrial and technological organizations. 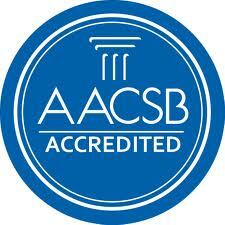 It has been recognized by the AACSB (Association to Advance Collegiate Schools of Business, USA) for its undergraduate, masters, and doctorate programs in Business Administration.